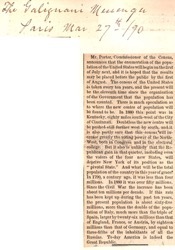 Mr. Porter, Commissioner of the Census, announces that the enumeration of the population of the United States will begin on the first of July next, and it is hoped that the results may be placed before the public by the first of August. The census of the United States is taken every ten years, and the present will be the eleventh time since the organisation of the Government that the population has been counted. There is much speculation as to where the new centre of the population will be found to be. In 1880 this point was in Kentucky, eighty miles south-west of the City of Cincinnati. Doubtless the new centre will be pushed still further west by south, and it is also partly sure that this census will increase greatly the voting power of the North-West, both in Congress and in the electoral college. But it also is unlikely that the Republican gain in that quarter, including even the voters of the four new States, will deprive New York of its position as the "pivotal State." And what will be the total population of the country in this year of grace? 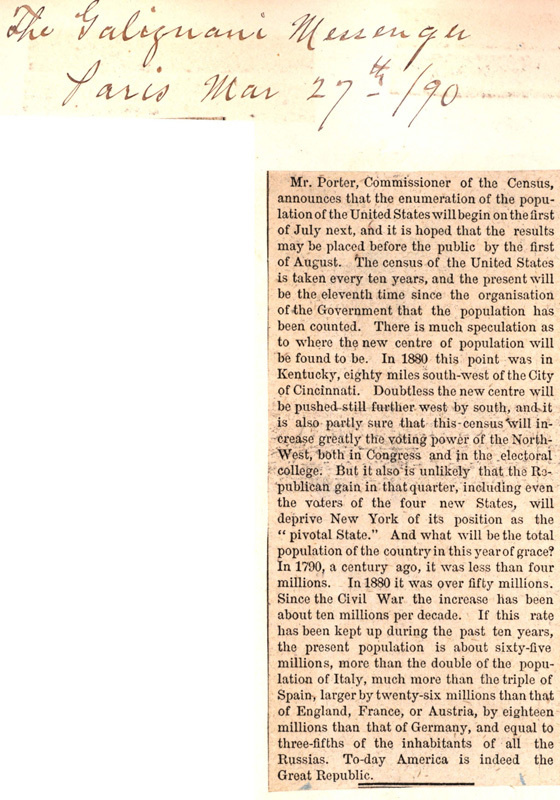 In 1790, a century ago, it was less than four millions. In 1880 it was over fifty millions. Since the Civil War the increase has been about ten millions per decade. If this rate has been kept up during the past ten years, the present population is about sixty-five millions, more than the double of the population of Italy, much more than the triple of Spain, larger by twenty-six millions than that of England, France, or Austria, by eighteen millions than that of Germany, and equal to three-fifths of the inhabitants of all the Russias. To-day America is indeed the Great Republic.